Hudson Valley Community College held a groundbreaking ceremony for its new $14.5 million, 37,000-square-foot Gene F. Haas Center for Advanced Manufacturing Skills (CAMS) on Wednesday, April 11, on campus at the college. Dr. Andrew J. Matonak, president of Hudson Valley; the College Board of Trustees; the Board of Directors of the Hudson Valley Community College Foundation; elected officials, manufacturing industry leaders; students, faculty and staff were all in attendance to celebrate the momentous event. According to the U.S. Bureau of Labor Statistics, there are approximately 900,000 more manufacturing jobs today than in 2010, but the country's manufacturing companies are struggling to hire qualified employees necessary for business and economic growth. By 2020, more than 200,000 new positions are expected for machinists and industrial maintenance technicians nationwide. With the construction of the new Center for Advanced Manufacturing Skills, Hudson Valley is even better positioned to help fill the shortage of well-trained, skilled craftspeople and help manufacturing firms to expand, create new jobs and contribute to the ongoing economic growth of the Capital Region. The construction of CAMS will allow the college to double enrollment in the Advanced Manufacturing Technology (A.O.S.) degree program from 144 to 288 students and meet an urgent workforce demand for skilled manufacturing employees in the region. The college's Advanced Manufacturing Technology degree prepares graduates for careers as CNC machinists/programmers, tool makers and industrial maintenance technicians along with technical marketing, sales, procurement and manufacturing supervisory/control jobs. It is the only community college training program of its kind within 125 miles. It has a 100 percent job placement rate for graduates, with nearly all students securing work prior to of graduation. CAMS is envisioned as a one-stop manufacturing technology center that will train students on the latest machine tools, equipment, tooling and software for employment with manufacturers in the Capital Region. The building's design provides corporate partners with access to offices and conference space adjacent to faculty offices, student classrooms and labs. Facilities will be available for corporate demonstration purposes, shared training activities, meetings and events that connect the college to its workforce partners more than ever before. The Hudson Valley Community College Foundation worked for two years to secure gifts toward the construction of CAMS, including a leadership challenge gift of $1 million from the Gene Haas Foundation, a longtime partner of Hudson Valley and provider of the equipment used in training its students; a $2.9 million grant through Empire State Development as part of the New York State Regional Economic Development Council awards announced by Governor Andrew M. Cuomo in December 2017; and $1.5 million in federal funding through the U.S. Federal Economic Development Administration, announced by U.S. Senate Minority Leader Charles Schumer and U.S. Senator Kirsten Gillibrand in December 2017. The college has partnered with several local construction companies to build CAMS, which was designed by Troy-based architecture firm Mosaic Associates. Contractors include: Bette & Cring Construction Group of Latham for general construction; Tri-Valley Plumbing & Heating, Inc. of Schenectady for plumbing; John W. Danforth Co. of Ballston Spa for mechanical; T&J Electrical Associates, LLC of Clifton Park for electrical; Comalli Group, Inc. of Albany for communications cabling; and Atlantic Testing Laboratories, Limited of Clifton Park for special inspections. "We at Hudson Valley Community College are proud and excited to break ground on the Center for Advanced Manufacturing Skills today, and usher in a new era of progress in manufacturing education in our region," said Drew Matonak, president of Hudson Valley Community College. "I would like to thank the donors, public officials, and industry partners who have made it possible for us to reach our goals and break ground on this wonderful project today. Your support and generosity has made this victory possible, and your help goes beyond the college, to the community — especially employers in the manufacturing industry that need skilled workers to expand, and the students that will be able to secure excellent jobs thanks to their training in this center." "As chairman of the college's Board of Trustees, I'm proud to see the community and the college come together to make this newest addition to the Hudson Valley campus possible," said Neil Kelleher, chairman of the Board of Trustees at Hudson Valley Community College. "CAMS will be one of the most advanced training centers for manufacturing in the United States, and we all look forward to watching the positive impact it will have on the economic development of our region. That would not have been possible without the support of partners large and small throughout the Capital Region, and we are grateful for each of their contributions. The Haas Foundation, Haas Automation and associated companies, and Mr. Gene Haas himself have been instrumental in making this project a reality, and it is has been an honor to work with them in this effort to better the college and community." "On behalf of the Foundation, I would like to express my gratitude to all the donors and partners who made it possible to bring the vision of a new center for advanced manufacturing skills to life," said Frank Sarratori, chairperson of the Hudson Valley Community College Foundation. "This remarkable achievement would not have been possible without the generosity and dedication of so many businesses, individuals, government officials, alumni and other donors and volunteers. I'd also like to give thanks to our CAMS Campaign Committee, led by co-chairs Dave Davis, president and COO of Simmons Machine Tool Corporation, and Marty McGill, vice president of Allendale Machinery Systems. This is a fine example of so many people coming together for the betterment of our community." "The GH-CAMS groundbreaking is a celebration of this region's manufacturing community, built to last on a foundation of investment in our people's skillsets," said President and Chief Operating Officer of Simmons Machine Tool Corporation David William Davis. "These skillsets are in high demand, employable positions critical to deployment of advanced manufacturing technology in a wide range of industries from large to small businesses." 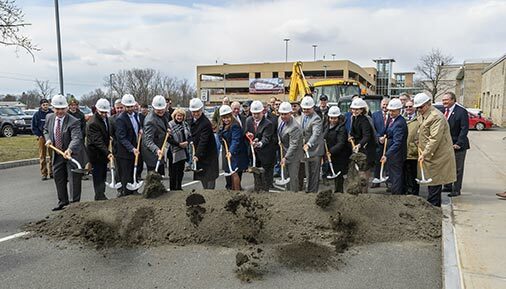 Empire State Development President, CEO and Commissioner Howard Zemsky said, "Workforce development is one of the pillars of spurring economic growth in the 21st century and is critical to attracting and growing businesses, especially in the Capital Region. Hudson Valley Community College has been training the next generation of advanced manufacturing employees for years and their experience coupled with the program's expansion will help to ensure local companies have the skilled recruits they're looking for." Founded in 1953, Hudson Valley Community College offers more than 85 degree and certificate programs in four schools: Business; Engineering and Industrial Technologies; Health Science; and Liberal Arts and Sciences; and an Educational Opportunity Center for academic and career training. One of 30 community colleges in the State University of New York system, it has an enrollment of nearly 11,500 students, and is known as a leader in distance learning initiatives and workforce training. Hudson Valley has more than 80,000 alumni.